Chicken Liver Gravy is so easy to make, you're going to love it. Well, your dog will love the irresistible taste combination of cooked chicken livers and chicken broth that she may request a ladle of gravy over every meal. 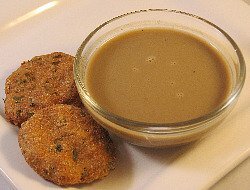 But don't think that this simple gravy is boring. On the contrary, there are so many fun ways of making this easy dog treat recipe into good dog eats. This is a wonderful treat for our dog friends with food allergies. With just a few ingredients, none of which are wheat or gluten, you can enjoy this dog treat recipe worry free. This lip smacking liver gravy is a great place to hide beneficial liquid or powdered dog vitamins, supplements or his regular medicines. Medicine time never tasted so good. We've added a new feature - You can click on the picture above and be taken directly to the featured recipe. We're holding our first contest for all dog bakery owners and other dog businesses! To enter submit your dog bakery or dog business on our website for your very own free business listing. You can find it here at Submit a Dog Bakery. All of the bakeries and businesses submitted by the end of Tuesday, August 31st will be entered to win a featured place in the September issue of this newsletter, Dog Treat Mixing Bowl. Follow the entry guidelines for a free business listing already outlined on the Submit a Dog Bakery page. Pictures are not required, but they are highly recommended. The reason is that you are showing off your handy work. Whether that be your homemade dog treats or other dog products and services. The more creative or unique, the better. Put some real thought into your free business listing. You want your listing to whet the appetite of your reader into learning more, buying or using your service. Not only do we get thousands of visitors to our website every month, but we also have thousands of newsletter subscribers that will see your business! Why not put your business right in their path by listing your dog business for free! :) Add pictures of your treats, products or services to help show off your hard work. Adorn your kitchen counter with beauty. No, not a fancy appliance, a tasteful and functional dog treat jar. Gone are the days when your dog's treats are hidden from sight or kept fresh with a clip. Now treats can be housed in a personalized jar just for your special little family member. If you haven't checked out dog treat jars in awhile, you'll be surprised at the array of colors, shapes and sizes. If your dog already knows the familiar sound of a ceramic jar opening, then give the gift of beauty and function to a deserving friend. Don't forget to fill it with homemade dog treats! We're making another first for Dog Treat Kitchen. We sat back and realized that we don't have any sandwich dog cookies! What a terrible oversight! So, for September we'll bring you a fantastic recipe for your very own dog cookie with a creamy filling.